500W of thunder that easily fit in your gig bag. Weighing in at fewer than 4 lb. 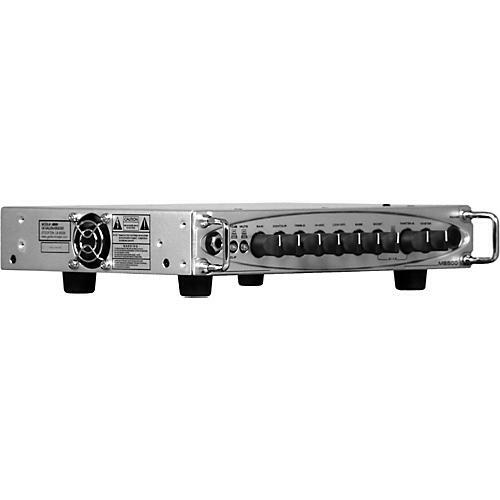 and taking up less than one rackspace, the MB500 delivers 500W of signature GK tone in a sleek, compact, modern head. Boasting GK's legendary 4-band active EQ and contour control, the MB500 lets you tweak your tone to perfection before hitting the digital power section. In addition to its generous tone-shaping capabilities, the preamp section has a footswitchable boost channel with independent volume control to dial in just the right amount of grind and level boost when needed. The MB500 is stage- and studio-ready with an XLR direct out with pre-/post-EQ selector and ground lift. Also offers a tuner out with mute, FX loop, headphone/line out, and dual Speakon outputs.